After a long, sun deprived UK Winter, five Cornish surfers headed out to Lanzarote searching for good waves, weather and Sangria… they were not disappointed. Lanzarote is a perfect playground for airs with strong winds allowing for maximum and protection. Here, Seb throws a big rotator into the flat. In the contingent were: Seb Smart and girlfriend Calypso Mzera; Sam Breeze, a fine photographer; Sam Smart, a powerhouse who surfs like Occy; and Joel Bishop, a semi-pro tennis player. They arrived in Lanzarote half asleep and dehydrated, particularly Sam Smart who has a chronic fear of flying and likes to take away the edge with scotch or Stella. Coming from the UK and being used to driving on the left-hand side of the road instead of the right can always be a challenge when faced with pedals, a steering wheel, and a gear box that are on the opposite side of what you’re used to. Joel found that to his cost with the hire car which he scraped on the side of the road. It was only a minor smack and nobody was hurt, but it left a large ding on the side of the car. After the flight and journey to the villa, we were mightily pleased to get there. Surfboards were set up, wetsuits slung out by the pool, and the empty cupboards and fridges were now full of food. Within hours, a sunset session was underway, and the boys were shredding. Seb was punting rotations, Sam was breaking the sound barrier, and Joel was taking off deep on drainers that to most people wouldn’t seem possible. Sam Breeze was getting shots every other second working with different angles and ideas, and Calypso was taking advantage of the last bit of warm sunlight on the dark, hot volcanic sand. Seb tucks under a sun dappled lip at one of Lanza’s many slabs. The next day, our first full day on the island, went pretty much the same way: two surfs, sunlight, vitamin D, wine, good food, photos, surfing, airs, and volcanoes. The trip ran like this pretty much every day. It was warm and friendly, until one day things got complicated. One evening, everybody was sat in the villa, relaxing, watching surf videos, and cooking dinner, when suddenly there was a very loud knock at the door. Seb answered and was confronted by two policemen who didn’t speak a word of English. Seb didn’t speak a word of Spanish, so things were certainly confusing. They pushed Seb aside and blasted into the house shouting and screaming. As both policemen pushed into the villa, they abruptly left as quickly as they entered, still screaming and shouting. They ran around the corner and were never seen again. We don’t know what they wanted, and still don’t to this day. Maybe they were looking for someone or something? At any rate, the conversation about the crazy officers was pushed after a number of ice cold beers and fine wine, and our conversation turned to having a night out, especially as we knew the next day we wouldn’t be surfing as the forecast was for small, windy surf. 30 euros took them to the town ‘Puerto del Carmen’, which was a 25 minute drive away. A watered down Kuta came to mind, but it seemed enjoyable. Again, things ran smooth, until suddenly it got ugly. Sam Breeze was talking to two Russian girls who both seemed nice and friendly. One seemed a little cold, maybe capable of killing someone, and the other one did have those eyes that say: ‘I’m nice, but if you step out of line, I’ll take your life, if not your soul at least’. Other than that, they seemed cool. Within moments, Breeze and the two girls were gone, nowhere to be seen. We found out later on that was led to their villa – which was literally in the middle of a volcanic desert – and found himself at a full blown house party in the middle of nowhere. He was too drunk to move or speak and was taped to the sofa. He looked down and noticed his shoes were gone; a new pair of Vans, literally taken from under his feet. He managed to break free from the duct tape, picked himself up, and looked around to see if he could see the girls, but he was seeing double, the room was sloping, and his head started to spin. He walked out of the house and didn’t stop. He walked, and walked, and walked, until eventually he found himself in total darkness. He turned around and saw Puerto del Carmen in the distance, looking like a small ferry out to sea slowly receding. He started to head to the lights of the town but fell. Semi-conscious, he was in complete darkness in a volcanic wasteland. Vomit trickled from his mouth and onto his T-shirt, and strange sounds came from the darkness – sounds he couldn’t recognise. Tigers? Dinosaurs? Cutting a long, character building, life changing story short, it was time for Breeze to take responsibility for himself and man up. He burrowed himself into his igloo-style dwelling which he had compiled using fragments of volcanic rock, cut his losses, and laid refuge there for the night. Somewhat freezing, but feeling safe. It wasn’t until sunrise he realised that the main road was right behind him. He flagged down the first car he saw and got a lift back to the villa. As he rocked up to the waves and peered over the hill, he saw Sam Smart paddle into a bomb and pull into a huge keg. Turns out the surf was good, and the boys were out there going crazy. Breeze needed to get some good footage for a video, so he grabbed his equipment and got down there to shoot. He was just in time to see Seb boost a 540 onto the flats, over-rotate, and come unstuck on the landing. Sam then dropped into something that looked like a monster and got eaten by the foam ball. 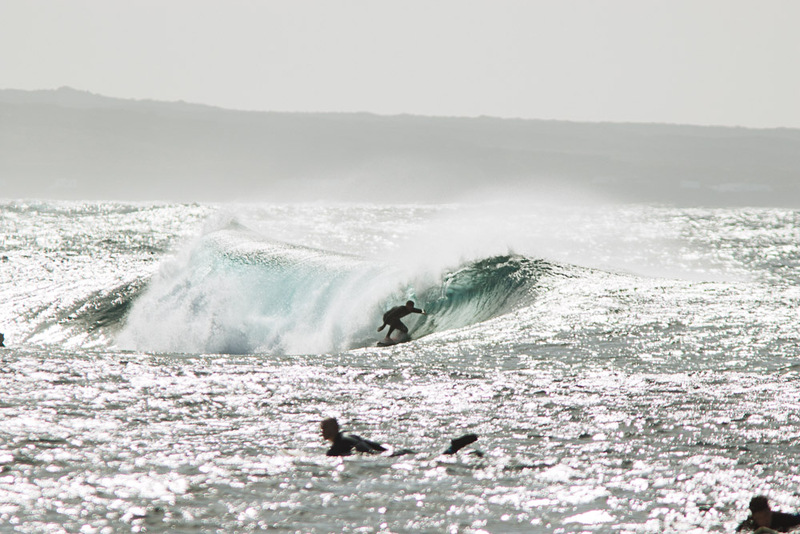 They then witnessed Joel take a hefty set full on the head; the wave blasted him backwards and smashed him onto the reef, tearing up his wetsuit and cutting his back. He came up with a sour look on his face, but still stoked to escape with just a few cuts. After checking the swell charts, it seemed the swell was jumping right up, so much so that La Santa would just be a big blown out mess. They decided to head east onto a whole different coast and found countless slabs with no one on them for two days straight. It was a wicked end to our ten day trip. We’re lucky to have the Canaries so close to the British Isles. It’s a great location to break up the winter for a bit of sun and surf. We didn’t get any grief off any of the locals, and the food and wine was great. It’s a cheap trip, where a hire car is essential, and the island offers a lot of variety and adventure if you’re keen to explore.